I think the Levi Roots story is an incredibly inspiring one for any budding food entrepreneur. It’s pretty amazing to see what the man has done with his brand to date ever since that unforgettable episode on Dragon’s Den when he brought his guitar into the den to charm Peter Jones and Richard Farleigh to back his Reggae Reggae BBQ sauce. Now, you will find everything from his recipe books to his salsas… marinades… even soft drinks… all lining the shelves of every major supermarket near you. Anyhoo, given it’s Notting Hill Carnival season, I decided it was fitting to give this mouthwatering recipe a try for W’s housewarming party which I saw Messrs Levi and Jamie Oliver cook up together on the tele. Bash up the allspice berries, peppercorns and chilli flakes in a pestle and mortar until you get a fine, spice blend. Mix in the rest of the ingredients, and give it another bash to make sure all the lovely flavours amalgamate. Using a sharp knife, make 2 or 3 deep cuts through the skin of the chicken into the bone (this will not only allow the chicken to cook faster and more evenly, but will give some natural grooves for the marinade to be stuffed into). 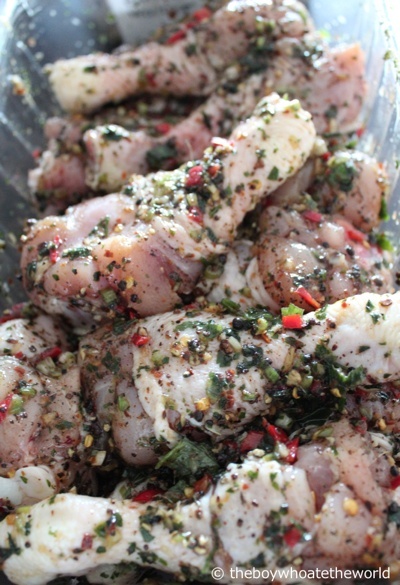 Using clean hands, rub the jerk marinade into the chicken. Leave for a minimum of 2 hours, but preferably overnight in the fridge. Pre-heat the oven to 180°C, and bake in the oven for 30-35 minutes. 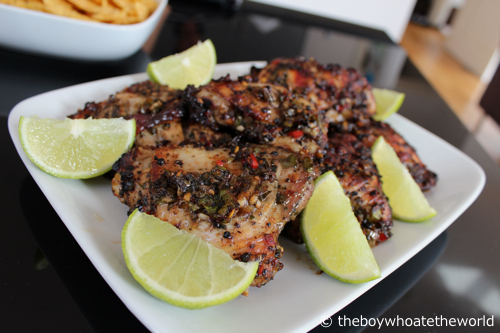 Have a quick squeeze of lime over the chicken before serving. That spicy, allspice berry rub and sweet ginger, garlic & herb marinade works wonders, especially when left overnight for the flavours to really penetrate into the chicken. Judging by how quickly the Chicken disappeared off the platter, it seemed a hit with the crowd. Happy Bank holiday Monday to all in London – you gotta love that priceless Sunday evening feeling knowing you have that one extra day of sleeping in!